Struggling to squeeze in enough play time for kitty? No problem – you’ve already got everything you need to inject a bit of fun into the day. You just don’t know it yet! A dancing piece of string is irresistible for most cats, which is exactly what this delivers – without you having to actively play String Master. Instead, when you move, it moves. This will keep kitty entertained at a low intensity for long periods, which is great for those feline brain muscles! Method: attach a piece of string (twine or shoelaces work well) to your ankle and carry on. Kitty will take it from here. 2. If I fits, I sits. Be it wine, online shopping or groceries, cardboard boxes come and go in our lives. If you leave them lying around it won’t be long before they are occupied. Chane it up with different boxes and locations to create a dynamic environment for kitty to explore. Method: unpack your new goodies and throw the box casually onto the floor. After a day or two, clean up. 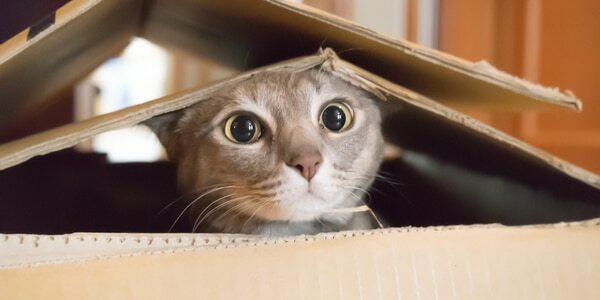 When the next box arrives, repeat. Is your cat more like a dog when it comes to food? This game gets food-motivated hearts racing, giving your cat a taste of the hunting chase. It works especially well if you have a long hallway or set of stairs to toss it down – watch kitty run! Have you got some great tips for playing with your kitty? Let us know and we’ll share them with the Kitska community! This entry was posted in Cat behaviour, Cat health and wellbeing, Cat training. Bookmark the permalink.